Naturally-formed druzy crystals create an eye-catching focal point for your ensemble. 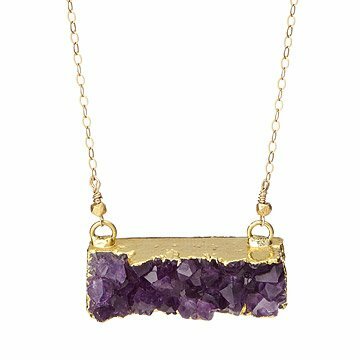 Featuring naturally formed druzy crystals, Lucy Dalton's violet stunner gives any outfit an organic edge. Druzy occurs as thousands of tiny shimmering crystal points blanket the surface of a gemstone, resulting in a one-of-a-kind faceted surface that catches the light beautifully. Adored for its ability to strengthen the spirit and dispel negative energy, glittering druzy is nested in a gold-filled bezel and turned into a wearable pick-me-up in Lucy's Brooklyn, New York, studio. Good for Feb, bd gift.